If you’re like me, you have nostalgic taste buds and you remember Baked Alaska being a fancy dessert your mom only made for special dinner parties. It went very well with an Old Fashioned cocktail, Beef Wellington and brightly colored polyester pantsuits. She probably learned how to make this dessert from her mom, who impressed her 1950s dinner guests even more than her daughter did. This dessert is a version of ice cream cake that’s finished by flash-baking it in a very hot oven to brown the outside, keeping the inside frozen. It has Swiss and French origins, then migrated to America with several modifications, like replacing the outer pastry crust with whipped egg-whites with sugar — otherwise known as meringue. The dessert picked up its current name by a pastry chef in New York, who made it famous during the time the U.S. acquired the Alaska territory. This Baked Alaska Cups recipe uses brownies for the cake portion, strawberry ice cream, then classic meringue in individual serving cups — canning jars work very well for this! And it’s easier than you think. You can make them ahead of time, then store the cups in the freezer until dessert time. Just pop them in a 500-degree oven for 2 minutes and your guests can enjoy their own retro-chic treat. (And don’t worry; canning jars were made to withstand extreme cold and heat, as well as going in between.) The combination of frozen ice cream and brownie with hot meringue is sublime. PLACE six 8-ounce custard cups on baking sheet; set aside. SPRAY 11 x 7-inch baking pan with nonstick cooking spray; line pan with foil, allowing foil to hang over edges of pan. Spray foil with nonstick cooking spray. PREPARE brownie mix (or your favorite brownie recipe) according to package directions; spread in prepared pan. Bake according to package directions. Cool completely in pan; lift brownie from pan using foil overhang. Cut into six rounds with a 3-inch diameter cookie or biscuit cutter. (If you’re using canning jars, you can use the jar to cut the brownies to correct size: turn jar upside down, press into brownies, turn back over and press brownie down with spoon, as shown above). PLACE each brownie round in the bottom of the custard cups. Top with ½ cup of slightly softened ice cream and smooth to sides of cup, as shown above. Place on baking sheet and freeze for at least 1 hour and up to 24 hours. BEAT egg whites in an electric mixer with whisk attachment on medium speed until foamy. Add the cream of tartar; continue to beat until soft peaks form, as shown above. Slowly add sugar and vanilla; continue beating until glossy peaks form. REMOVE cups from freezer. Spoon the meringue evenly over the top of each cup (roughly ½-3/4 cup each), covering the top completely and swirling the meringue into a high dome, as shown above. BAKE for 2 minutes or until meringue is browned, as shown above. Serve immediately. 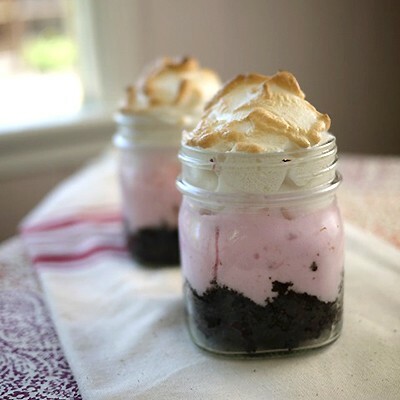 This Baked Alaska Cups recipe uses brownies for the cake portion, strawberry ice cream, then classic meringue in individual serving cups — canning jars work very well for this! And it's easier than you think. You can make them ahead of time, then store the cups in the freezer until dessert time. Just pop them in a 500-degree oven for 2 minutes and your guests can enjoy their own retro-chic treat. The combination of frozen ice cream and brownie with hot meringue is sublime. PREPARE brownie mix according to package directions; spread in prepared pan. Bake according to package directions. Cool completely in pan; lift brownie from pan using foil overhang. Cut into six rounds with a 3-inch diameter cookie or biscuit cutter. PLACE each brownie round in the bottom of the custard cups. Top with ½ cup of slightly softened ice cream and smooth to sides of cup. Place on baking sheet and freeze for at least 1 hour and up to 24 hours. BEAT egg whites in an electric mixer with whisk attachment on medium speed until foamy. Add the cream of tartar; continue to beat until soft peaks form. Slowly add sugar and vanilla extract; continue beating until glossy peaks form. REMOVE cups from freezer. Spoon the meringue evenly over the top of each cup (roughly ½-3/4 cup each), covering the top completely and swirling the meringue into a high dome. BAKE for 2 minutes or until meringue is browned. Serve immediately. Yes! Canning jars are safe for both freezer and 500 degrees, as well as going between. I made this recipe using small canning jars no problem. Thought your recipe looked cute…I make Baked Alaska all the time…my signature dessert. However cute yours maybe…I would never take glass from the freezer and put into a hot oven…setting yourself up for a disaster!! Not really, mason jars are made to do that. They are usually taken from boiling water to fridge with no problem. And custard cups, the same thing. I’ve never had a problem with it.